NEW YORK, NY--(Marketwired - May 17, 2016) - Jacqueline Cox has been appointed as director of sales and marketing for the Quin, New York's quintessential luxury lifestyle hotel, located at 57th Street and Sixth Avenue. In her new role, Ms. Cox is responsible for all aspects of the hotel's sales and marketing efforts, as well as building business relationships in the region. Her extensive relationships in luxury fashion, consumer products and finance are an ideal fit for a hotel that has quickly established itself as a luxury retreat at the intersection of fashion and commerce in the heart of Midtown. She will report directly to the Quin's managing director, Vincent Vienne. Ms. Cox has more than 15 years of experience in the luxury lifestyle sector of the hospitality industry, having represented leading brands in the United States, Europe and Asia. After earning a degree in International Business from Griffith University, in Australia, Ms. Cox launched her career in Seoul, South Korea with InterContinental Hotels and Resorts as manager of marketing and promotions. She went on to join Accor Hotel Group in London as manager of group sales, before moving stateside with Viceroy Hotel Group, based in Los Angeles, as director of group sales. She is a seasoned sales director who has, for more than 8 years, motivated teams to exceed their targets through training, development, and empowerment. Most recently, as corporate director of sales and marketing for Gansevoort Hotel Group, Ms. Cox was responsible for leading the New York regional sales team, representing Gansevoort Meatpacking NYC and Gansevoort Park Avenue NYC. She oversaw daily sales operations and long-term strategy for a team of 12 department staff including corporate sales, group, leisure, special events, and conference services. 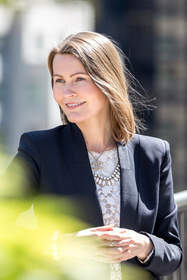 Vincent Vienne, the Quin's managing director, commented, "Jacqueline's six years in New York have given her a keen sense of all that makes this city so remarkable, but her international background and experience also allow her to intuitively connect with corporate and leisure guests in a variety of key target markets for the Quin." The Quin is managed by Highgate, a premier hospitality investment and management company whose growing portfolio includes more than 100 properties in gateway cities worldwide. The Quin, New York City's quintessential luxury lifestyle hotel, is located on the corner of 57th Street and 6th Avenue. At the intersection of art, music, and fashion, its privileged Midtown location provides effortless access to Lincoln Center, Carnegie Hall, The Museum of Modern Art and Fifth Avenue couture. The Quin melds modern opulence with its rich artistic heritage in each of its 208 thoughtfully appointed guestrooms, including 28 suites. Guests enjoy urbane and intelligent services from the QA, who curate each guest's New York experience, to distinguished amenities like an Executive Boardroom, state-of-the-art Technogym fitness center, Apple equipped drawing room, Dux® beds by Duxiana®, and Fresh® Spa Products. Guests can also indulge at The Wayfarer, a classic American grille, located adjacent to the hotel. The two-story, 130-seat restaurant offers breakfast, lunch and dinner daily, weekend brunch, and a full, 24-hour, in-room dining menu from Executive Chef Chris Shea for hotel guests, featuring classic American dishes, redefined. Quin Arts is an interactive arts program curated by DK Johnston that celebrates the property's rich artistic heritage and produces exciting new platforms for contemporary artists. Renowned architecture and interior design firm, Perkins Eastman, has transposed a contemporary masterpiece on the classical foundation that was once home to cultural icons like pianist Ignacy Jan Paderewski and artist Georgia O'Keeffe. Follow the Quin @thequinhotel. Reservations are available at 1-855-447-QUIN (7846) or http://www.theQuinhotel.com/. Highgate is a premier hospitality investment and management company widely recognized as an innovator in the industry. Highgate is the dominant player in U.S. gateway markets including New York, Boston, Miami, San Francisco and Honolulu. Highgate also has an expanding presence in key European markets through properties in London, Paris, Barcelona, Vienna and Prague. Highgate's portfolio of global properties represents an aggregate asset value exceeding $10B and generates over $2B in cumulative revenues. The company provides expert guidance through all stages of the hospitality property cycle, from planning and development through recapitalization or disposition. Highgate also has a proven record of developing bespoke hotel brands and utilizes industry leading proprietary revenue management tools that identify and predict evolving market dynamics to drive outperformance and maximize asset value. With an executive team consisting of some of the industry's most experienced hotel management leaders, the company is a trusted partner for top ownership groups and major hotel brands. Highgate maintains corporate offices in London, New York, Dallas, and Seattle.